Glad I got your attention! I am asking a HUGE, massive favour of each and every one of you who ever shops for anything from Amazon. We are now an Amazon affiliate which means that if you get to Amazon.co.uk or Amazon.com through the Gumby Legacy website and end up buying ANYTHING, we get a small percentage of commission. It does not cost you any more than if you went direct to their page. All of this money will go straight into our donations and towards keeping our projects and this website up and running so please, PLEASE click on our advert before you make a purchase. You can either click on the advert as shown in the picture (it’s on the right hand side of every page) or you can access it by clicking on one of our recommended product links. This means that if we recommend a book or other product, we can link it to Amazon and if you purchase the product we have recommended or ANYTHING else in that shopping trip or for up to 24 hours after clicking our link (and no-one else’s), we will get a small commission. 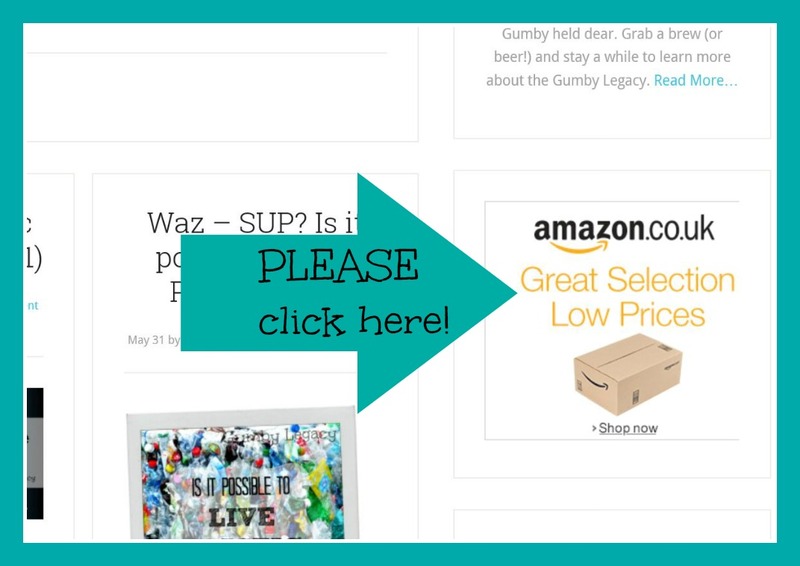 We promise to always let you know if we have put an affiliate link into one of our posts and will only ever recommend products that we use ourselves or think that you may find helpful. If you want to read anymore about affiliate links, here is a useful link. PLEASE remember to use our link when you buy anything from Amazon and help support our great projects!